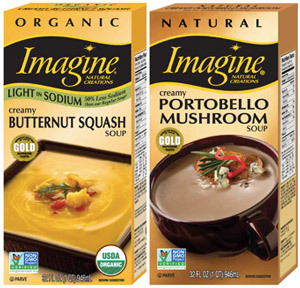 Kudos to Imagine Foods for this all dairy-free line of creamy soups. Some of the more exotic varieties captured our taste buds, but the more "traditional" flavors left a little to be desired. Dairy-free creamy soup isn’t what I would call a common convenience item in most grocery stores, but Imagine Foods has continued to expand their all dairy-free line, which includes a somewhat traditional creamy Tomato Basil, an out of the ordinary creamy Carrot Almond, and several flavorful varieties in between. Below are my notes on the creamy soup flavors that we have sampled from Imagine Foods, followed by some general notes about the products. If you’ve sampled any of the Imagine organic creamy soup varities, feel free to leave a comment and let us know your thoughts! 4 Stars – This is another soy-free cream soup option that contains just water, butternut squash, onions, rice syrup, expeller pressed oil, rice flour, spices, and sea salt (when I purchased it – remember, ingredients can change!). 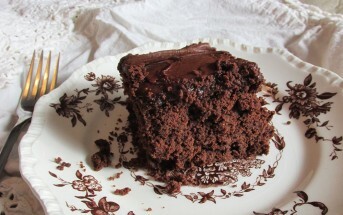 The texture is smooth, creamy, and a touch rich, while the flavor is pleasantly mellow. It is a very light “sipping” soup that didn’t fill me as a meal on its own. However, I really enjoyed it as the base for a heartier lunchtime soup. It was excellent when combined with rice and chopped steamed vegetables. Broccoli and sweet onions were the most popular additions, though red bell peppers, spinach, and green onions are naturals with the butternut flavor. A dash of nutmeg or paprika also seemed to enhance the overall dish. We trialed adding some turkey and chicken to the soup, but I really feel that this is best as a purely vegan soup. Overall, I recommend the butternut creamy soup as a hearty soup base, a light meal or snack, or a quick warmer on cold winter days. 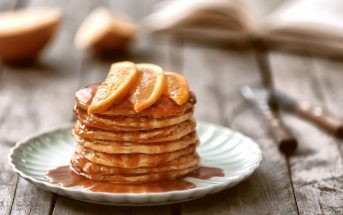 2 Stars – When I once again found myself face to face with a sale tag dangling beneath a “creamy” non-dairy soup, I carefully inspected the labels and went for the lowest sugar option and my favorite vegetable, broccoli. On its own, the broccoli creamy soup was good, but there was no “wow” factor. It had that distinctive natural broccoli flair, but was rather mild in flavor. The consistency was fine, but more of a rich vegetable puree than an all out creamy indulgence. I added some millet, a bit of black pepper, and for fun a dairy-free rice cheddar slice. The black pepper added just the right amount of zing, which the soup seemed to be lacking. The cheddar just barely melted, but definitely added some body to the soup. Not Condensed – These are creamy ready-to-eat soups, not condensed versions – so don’t count on them for those green bean casserole recipes! 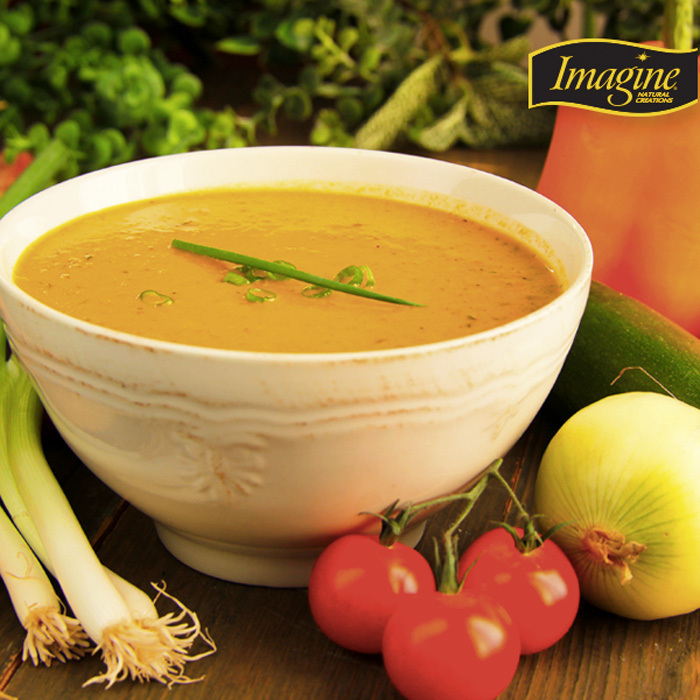 Low Calorie – With only around 60 to 120 calories per servings, the Imagine Creamy Soup line is waistline-friendly, but don’t count on them for a complete meal that will sustain you for hours. They make a warm snack or a meal-starter. Free-From? 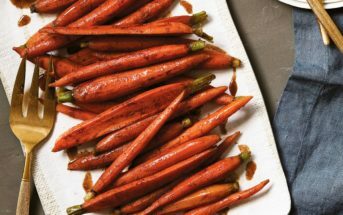 – In terms of special diet needs, all of these soups are dairy-free and egg-free by ingredients, but the rest is a mixed bag. Some are soy-free, some are nut-free, some are gluten-free, some are coconut-free, and most, but not all, are vegan. 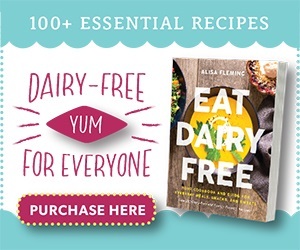 Cheesy Recipes – Oddly enough, for a company that touts non-dairy and vegan creamy soups, many of the recipes on their boxes seem to call for cheese or other dairy products! Think creatively in using these: baked potatoes, casseroles, served with spring rolls for dipping, etc. Price Shopping – These don’t go on sale quite as often as the broths, but keep an eye out! I’ve spotted them for as cheap as $2 to $2.50 per package during the cooler months. If you want to stock up, you can buy them for a slight discount on Amazon. Certifications: Imagine Organic Creamy Soups are Certified Organic, Certified Kosher, and Non-GMO Verified. Dietary Notes: By ingredients, these soups are dairy-free, egg-free, nut-free, vegetarian, gluten-free, and peanut-free. Many are vegan and soy-free. 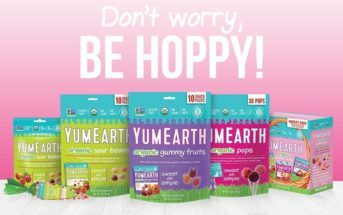 See my notes above about the “free-from” nature of this product line, and always check the ingredient statement for any of your allergen concers. Check with the company on their manufacturing processes before consumption if potential allergen cross-contamination is an issue for you. Processes and labeling are subject to change at any time for any company / product. 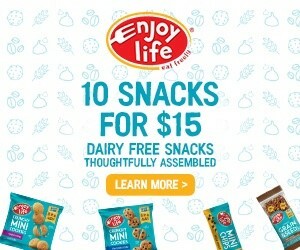 For More Product Information: Visit the Imagine Foods website at www.imaginefoods.com. Why are most of the Imagine soup products full of sugar?! The Portobello Mushroom soup and Potato Leek soup are tasty as they do not have added sugar in the ingredients. All of the other varieties that our local store stock taste like sickening sweet syrup and are a complete assault on my taste buds, as well as potentially dangerous to a diabetic who may assume, with the “organic” label, that the product would not be adulterated with added sugar. I am sure that most of the other soup varieties would be delicious if the company just eliminated the sugar. I’m not a big fan of sugar in my soup either Ross. I’m really not sure why so many brands do it, but it is very common. You might want to reach out to them directly on your preference. For a soup company, I would expect some really good soups. I tried 2 different flavors and to be honest, I’m not going to buy anymore. One of the soups I purchased was Loaded Baked Potato. I love baked potatoes and thought this would be nice for lunch. After tasting the soup, it doesn’t have any resemblance to a baked potato. I don’t recognize anything. The soup leaves a rather bad after taste in your mouth. I love soup, but this is not good. That’s a bummer those didn’t work out for you Denice. Please note though that the Loaded Baked Potato soup is not a dairy-free variety and I think it is in their Chunky Soup line. We have only reviewed the Creamy Soups to date, which are all dairy free. I’ve tried the squash mango and it was WAY too sweet. I also agree with the butternut and broccoli reviews – your taste buds are identical to mine! I LOVE the portobello mushroom soup though. In fact, i have a bag of dried shiitake mushrooms that I just may have to make into soup very soon. I’ll probably forget all about that though.